Washington – Sens. Richard Blumenthal and Chris Murphy on Thursday reintroduced legislation aimed at helping homeowners in Connecticut and Massachusetts who are plagued with crumbling foundations built with tainted concrete. Blumenthal sponsored the “The Crumbling Foundations Small Business and Homeowners Assistance Act of 2019,” which would establish a grant program through the Federal Emergency Management Agency, FEMA, to award funding up to $20 million each year for five years to reimburse affected owners of homeowners, small businesses and others for money spent to prevent, repair and mitigate damage caused by concrete foundations containing pyrrhotite. About three dozen towns in north-central and northeastern Connecticut – and some areas in nearby Massachusetts — have foundations built with concrete containing pyrrhotite from a quarry in Willington. Pyrrhotite is a mineral that expands with moisture and causes foundations to bow and crack. FEMA rejected former Gov. Dannel Malloy’s efforts to consider the crumbling foundation crisis a natural disaster that would be eligible for federal disaster relief. That bill also seeks $100 million over five years to establish a grant program at the U.S. Department of Housing and Urban Development for states like Connecticut that have created non-profit crumbling foundations assistance funds to help homeowners. 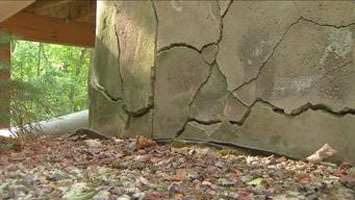 Connecticut has a Crumbling Foundations Assistance Fund to allow $100 million in bonding, which would amount to annual payments of $20 million, over the next several years to assist victimized homeowners. Payments from the relief program, which began processing claims last month, are capped at $175,000. That isn’t enough to cover the cost of raising a house and replacing a foundation — estimated at about $250,000 — however, which is why federal relief is needed. As of now, the only federal help for homeowners with crumbling foundations is the determination by the Internal Revenue Service — sought by Rep. Joe Courtney, D-2nd District, and Connecticut’s U.S. senators – to make an exception to the new federal tax laws that eliminated casualty loss deductions. The IRS announced last February it would allow Connecticut homeowners with crumbling foundations to take advantage of a deduction on qualified home repairs through December 2020. The senators introduced similar bills in the last Congress, but they did not win final approval. “The federal government must step up and provide real relief from the unconscionable stress and expense made worse by the unacceptable inaction of many insurance companies.” Blumenthal said.